I sat in on the JISC RSC Wales Lunchtime Byte webinar this week, delivered by David Kernohan of JISC, “Online learning at scale: responding to the MOOC invasion”. My experience of MOOCs (Massive Open Online Courses) so far consists of: lots of tweets washing over me about #oldsmooc #edcmooc etc; worried mentions of MOOCs threatening UK HE in various meetings here and there and, of course, I signed up for one a couple of weeks ago. I signed up quite last minute for the #teachtheweb MOOC which sounded great – interesting, short, very relevant to my work – but yet I failed at the first hurdle, getting to grips with Google Plus (it baffles me). So now my experience of that MOOC is receiving jaunty emails telling me the fun next stage I’m not taking part in. I signed up for the webinar mainly because it was being run by David Kernohan, who I thought would probably give a good, honest opinion of the issues surrounding MOOCs and I was right. 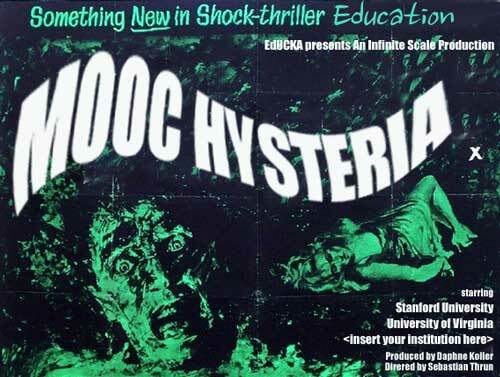 The main gist was how to respond to the MOOC ‘hysteria’ – I won’t attempt to summarise the hour long session – it’s here for you to view. MOOCs aren’t the future of HE. David stated from the outset was that MOOCs are not a fix for everything. They are good at certain things, but are not the future for the entirety of HE. It’s ok to be cynical about it. MOOCs & the Open Education Movement. I mistakenly assumed MOOCs were run using Open Educational Resources, but this was clarified. There are 3 strands to open education: Reusable Learning Objects, Commons and diyU. These have mingled into the Open Education Movement. However this is not a coherent movement – you can’t see OER & MOOCs on a continuum as part of the same thing. Dark side of the MOOC. It’s not just about expanding access: it’s about looking to replace structures that currently support education, which are not perfect but do a lot of good. The marketing language used by many MOOC course providers talks about how “HE is broken”, “HE is ripe for innovation”, how MOOCs revolutionise conventional models. What’s new in terms of pedagogy? Nothing much, the new parts are the hype and the funding/delivery model. Funding is coming from venture capital & large companies. Students either don’t pay or pay for accreditation. Later discussion highlighted that the teaching methods often involve a high level of transmission, involving for example watching pre-recorded lectures. In terms of the learning experience, a feeling of disconnection from the course tutors is common. The experience can often be inflexible and impersonal. Who takes parts in MOOCs? David reported that those taking in MOOCs are generally well-educated and from Western countries, so there are questions around the extent to which they are widening participation. Is a MOOC actually better for experienced learners as it requires self-regulation? In terms of numbers, enrolments are usually high but participation and completion rates tail off dramatically. For example, the University of Edinburgh’s #edcmooc had 42k enrolments, 17k participants and 2k completions. Defining / measuring achievement. There was some discussion of this issue in the webinar – completion rates were highlighted as being low, but is completion a red herring? (A pale pink herring was suggested…)What are they completing? People get what they want out of course and that may not require completion. David argued that the experience should be good enough that you should want to complete. The cost of MOOCs. As mentioned, courses are usually free for students, paying only for accreditation. In terms of costs to institutions, the development cost is indeed born by the educational institution and not the MOOC provider. Some providers give the impression that the course will run itself but in fact a lot more intervention is required from tutors. Learn about the Edinburgh experience in Jeff Hayward’s blog post There’s no such thing as a free MOOC David observed that the Pearson Vue testing centre is used by several MOOC providers, so they seem to be the ones making the money! Can any institution run a MOOC? This was news to me, but the two high profile providers, Coursera and FutureLearn, are both invite-only. Outside of the US, Coursera will only approach the top 5 institutions in each country to run a MOOC. Udacity is not open to institutions, only to individual academics who have to apply & don’t accept everyone. Blackboard & other commercial offerings, such as OpenClass and Instructure Canvas, are open to everyone – Sheffield University is offering courses on Blackboard Coursesites and Edge Hill runs the Vampire Fictions MOOC from its own Blackboard VLE. David noted that the marketing from these commercial options talks more about offering service to institutions, not about changing things that are broken. Is it just distance learning? Have MOOCs now become unintentionally funny as there is so much talk about them? Are they actually just distance learning?! David suggests the they hype shouldn’t be taken too seriously – it’s a diversion. Should it be treated more as an outreach tool? Telling more people about what university can be like and to come and engage. They are not likely to be the entirety of the future of HE. Links to the full recording, presentation slides and web links referred to during the session are on the RSC Wales site. This entry was posted in CPD, Reports, Teaching and tagged HE, MOOCs. Bookmark the permalink. Thanks Helen – really glad that you got such a lot out of the session. It was a nightmare to prepare, let me tell you! – & I wish the platform would have allowed for more community discussion. ‘you can’t see OER & MOOCs on a continuum as part of the same thing’. I find this interesting as MOOCs (certainly in my mind) were borne from the open education movement, and whilst many of the MOOCs currently do not include OERs, there’s nothing to say they cannot (CC licensed content could be included, and #edcmooc did do if I remember correctly). So I’m wondering if there could be a continuum where both exist – I’d suggest OER’s (of varying granularity) are already open to various degrees, so perhaps MOOCs would be at the lower end of ‘open’? You may have seen some of Amber Thomas’ work (http://fragmentsofamber.wordpress.com/2012/05/25/opensunlight/ see slides 6-9) and/or my own work on visualising openness ( http://thereeddiaries.blogspot.co.uk/2013/04/visualising-openness-republished.html) which could flesh this out further but I’d like to hear your thoughts. Hi Peter – you’ve picked up on the one sentence I didn’t feel completely clear about and after looking at your links I can certainly see MOOCs could exist at the low end of open. I think I need to spend some more time trying to get my head around it all! Thanks for giving your views. I think it’s hard to get the balance as sometimes you can get lost in discussion and not pay attention to the speaker! It was certainly more interactive than some webinars I’ve attended in the past. Helen I think the point about separating OERs and MOOCs as concepts was one of the more important ideas to pull out and you were right to do so. I’d suggest a resource is an ‘inanimate’ object and becomes a course when we begin directly working with others around/using that resource. So the remains of a MOOC can be a very useful OER from a number of perspectives (I’ve used several!) but these terms are different aspects of an approach. [Lou McGill’s terminology tool is really helpful in this regard.http://loumcgill.co.uk/oer-terminology/ ] To place a resource on one end and a course on the other end of a spectrum might be useful, but I don’t see that we can talk of OERs and MOOCs in this way as ‘MOOC’ means – as David made plain – very different things.to different people. The cMOOCs would not be on the lower end of any ‘open’ spectrum. Thanks for the comment Paige and the link to Lou’s terminology tool – I will keep an open mind regarding openness! Great summary of a really insightful webinar. Thanks, both. I too also tickled by the idea of an upcoming offline MOOC. Perhaps it happened some 40 years ago at the Open University?…. If you split the MOOC acronym into its component parts, you are often talking in terms of “three out of four ain’t bad”. (e.g. I enjoyed James Michie’s refreshingly honest reflective video about his ‘OOC’ here: http://jamesmichie.com/criticalskills/2013/03/crit101-the-interview/ ).